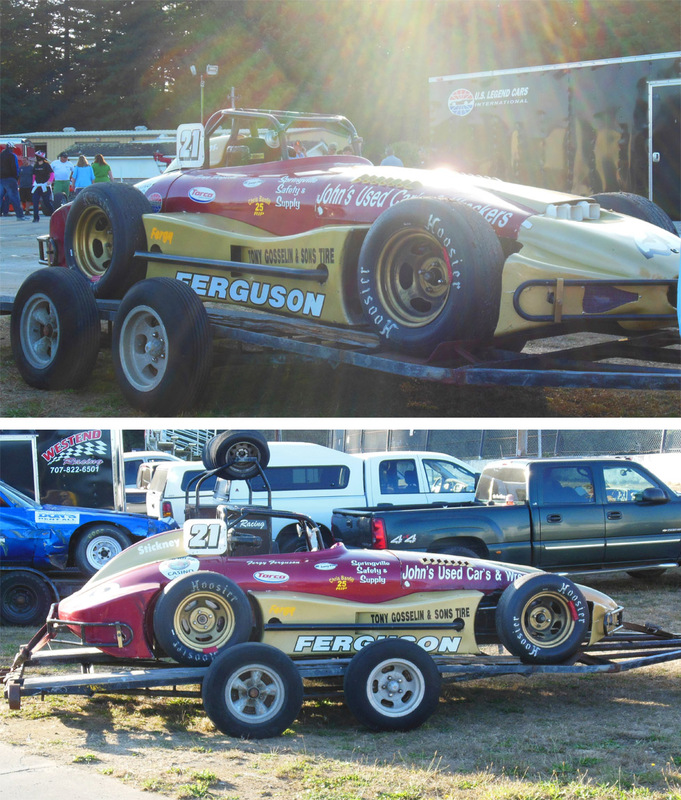 It is September and Clyde “Fergy” Ferguson is forced to sit out the 2013 season, out of a race car for the first time in 43 years, since his rookie year in 1970, due to needing hip replacements to get back into his Thunder Roadster. 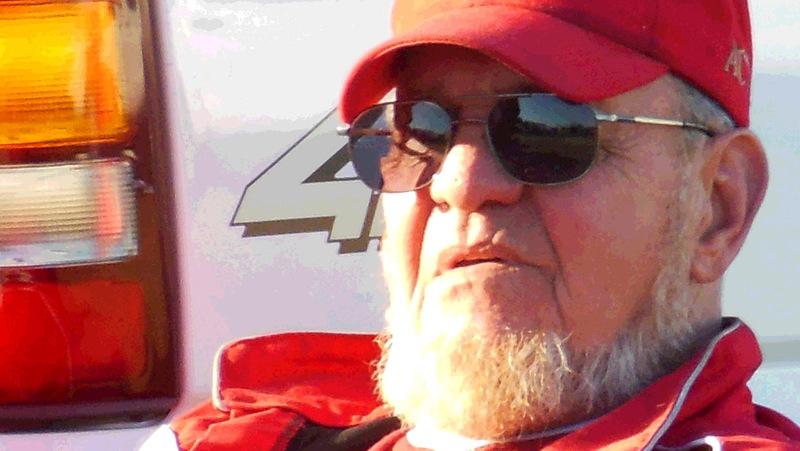 One of a handful of drivers who have been the continual face of Redwood Acres Raceway, his friendly manner and trademark Abe Lincoln beard and low, rich voice, together with his career as a railroad engineer have always given him a salt of the earth appeal, and he has remained a fan favorite at the track who has stood the test of time. 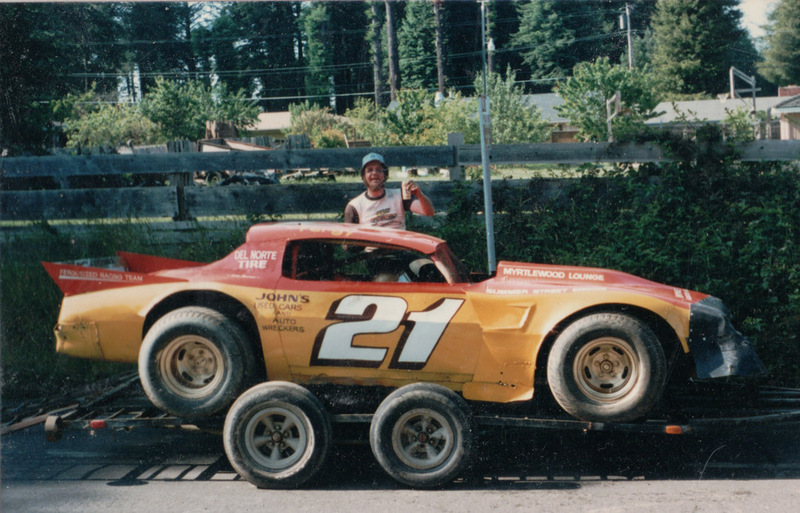 Racing in the old dirt days had its share of stories. 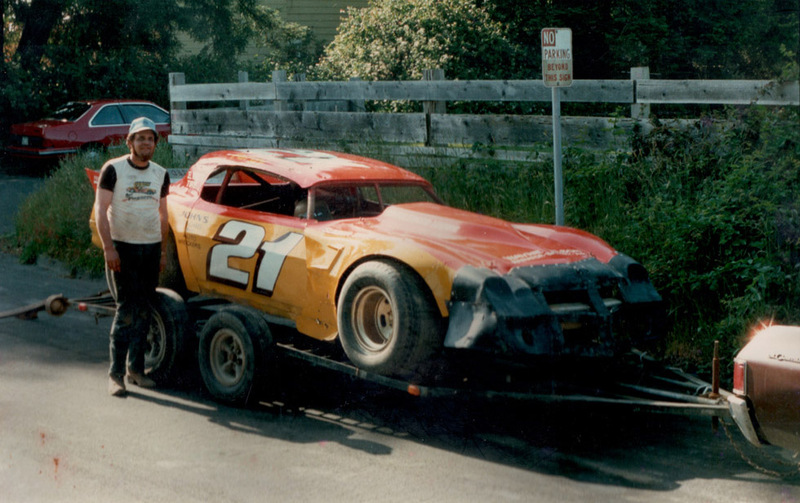 “If you talk to Angelo Marcelli, ask him about the Suitcase Race”, Fergy says, standing in his living room looking down at his feet, dropping the hint of a good story to be told. 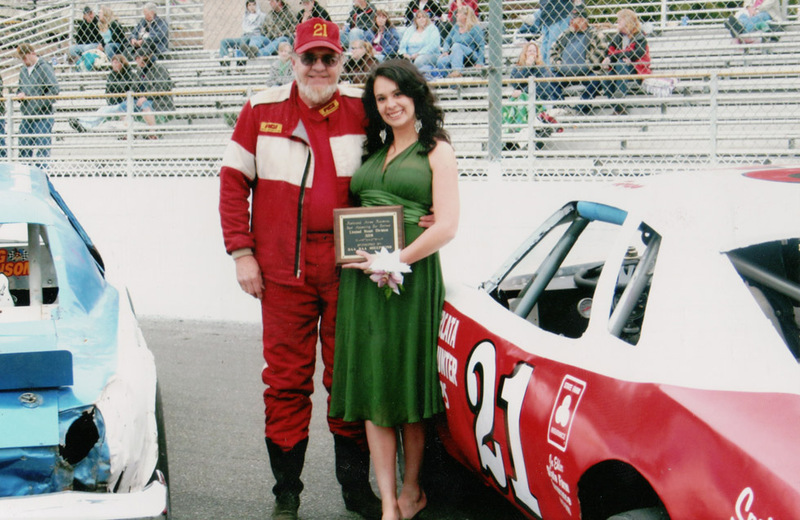 “We raced around the track, stopped, got out, then opened an old suitcase full of women’s clothing that we had to put on before getting back in and racing again. Angelo won but he cheated; while I was taking time to pull on the pantyhose, he was shoving his legs in and ripping them apart. 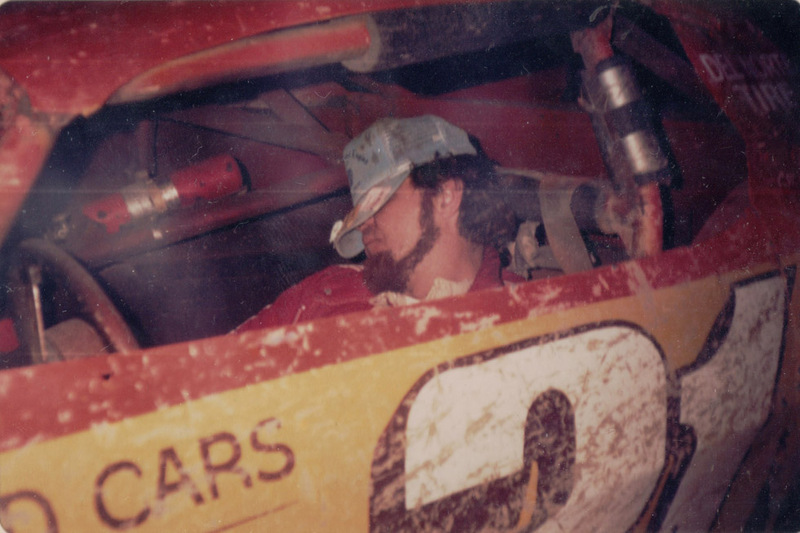 He didn’t care how they looked.” There was no comment about who might have had the edge in experience in such a race. 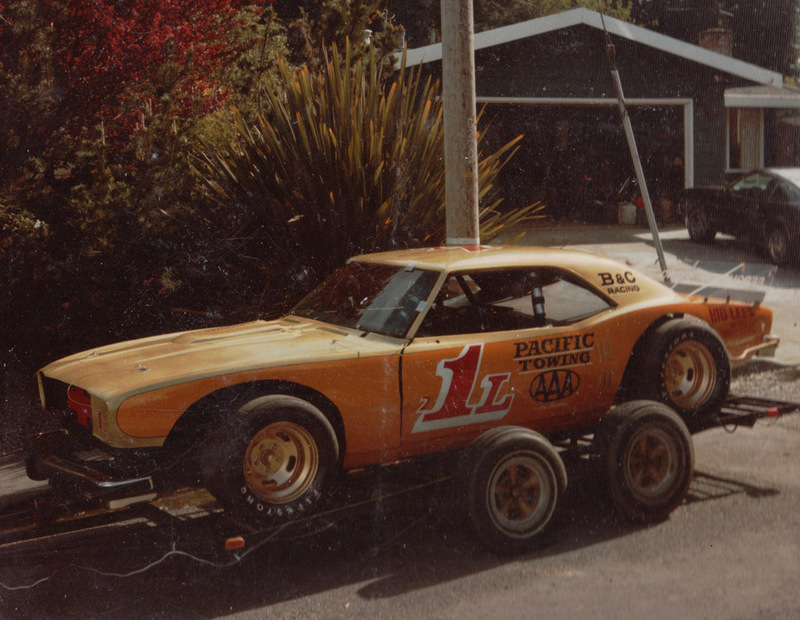 “I didn’t do a lot of out-of-towners, I went to Placerville with the first Super Stock I got. I bought John Morrison’s ’57 Chevy. I went to Redding a couple of times. 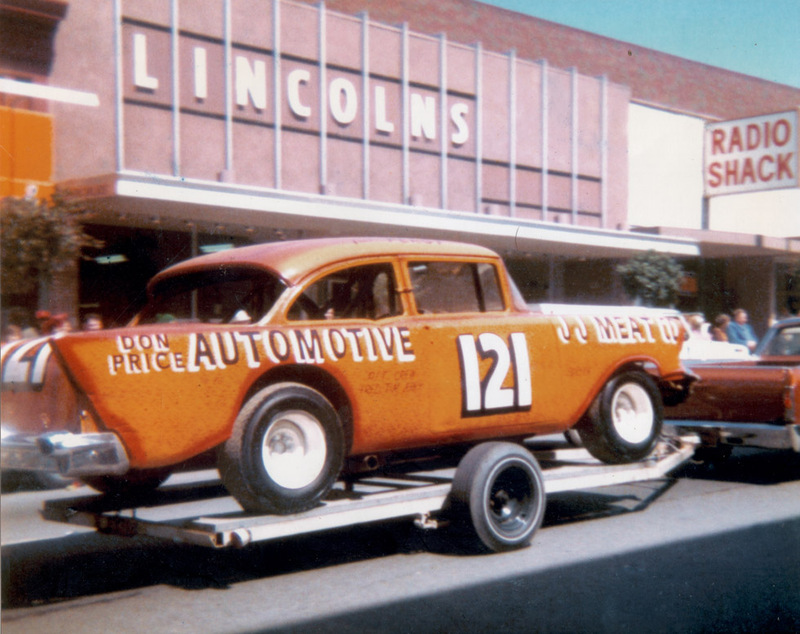 Never did get the gear ratio right for running on asphalt. They were dirt in the early years but they asphalted real soon. 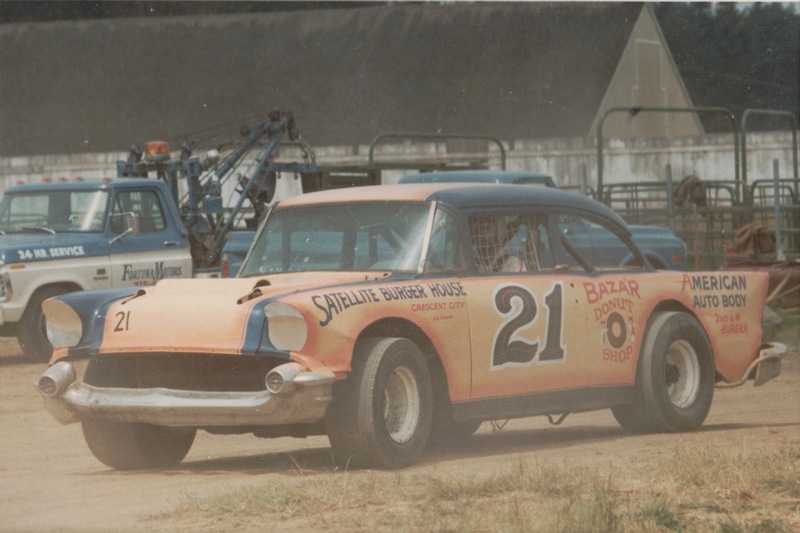 I went to Medford with the ’57 and turned fast time of the day up there. It was unbelievable. I went out and qualified, came in, I got out of the car and was walking and I hear sssssssssss and the air was coming out of one of the tires. I had run over something. I didn’t bring any spare tires, that was just what was on the car. 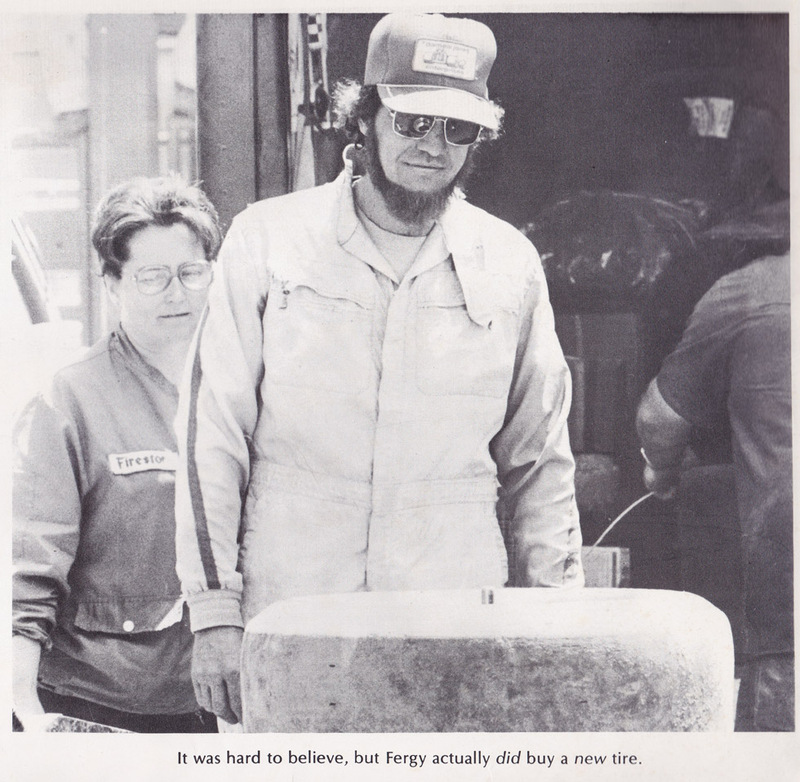 So I pulled the tire and ran it down town to see if there was someone who could patch it. I found some service station that would fix it for me and when I finally got back the guys were waiting for me and they said “Get in the car!” I said what do you mean get in the car, ‘You get in the car, you’re in the dash! You turned fast time!’ I said c’mon quit kiddin me. ‘No get in the goddamned car you’re in the dash!’ So I got in it and couldn’t do anything, they just beat me to death, I brought that car back and every rim was bent and the bumpers on both ends, they just tore me up. And I lost the clutch during the main event too. It was quite an experience. 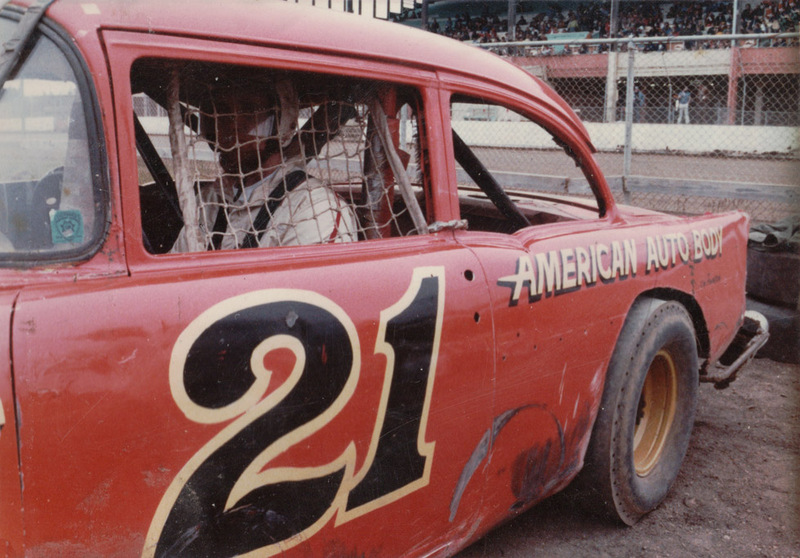 The dirt was similar to Redwood Acres, it had a little cushion to it. Quarter mile D-Shape and had a little tiny short straightaway; a turn all the way around. I just took the green, put my foot on the floor and let it hang out all the way around, never let it off. 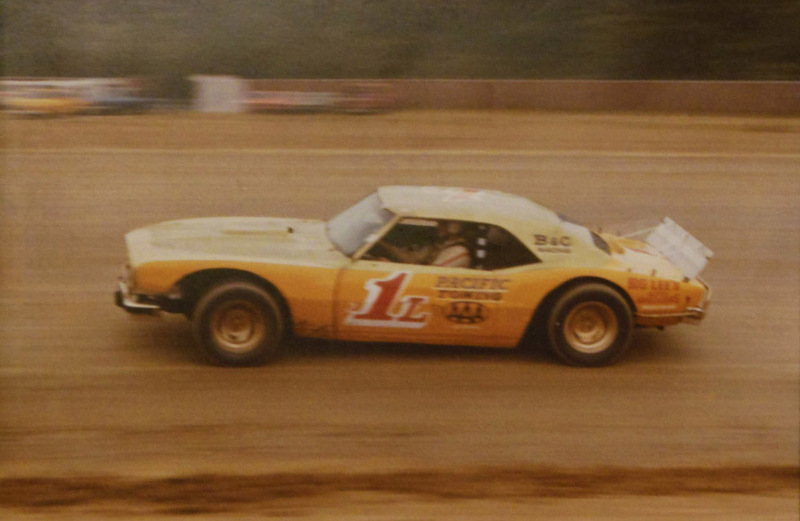 Beat all the fast guys, old Jack Keck, Tom Wyatt, all those guys were there. I actually turned faster than all those hot shoes. That was the highlight of my out of town career there”, he says laughing. 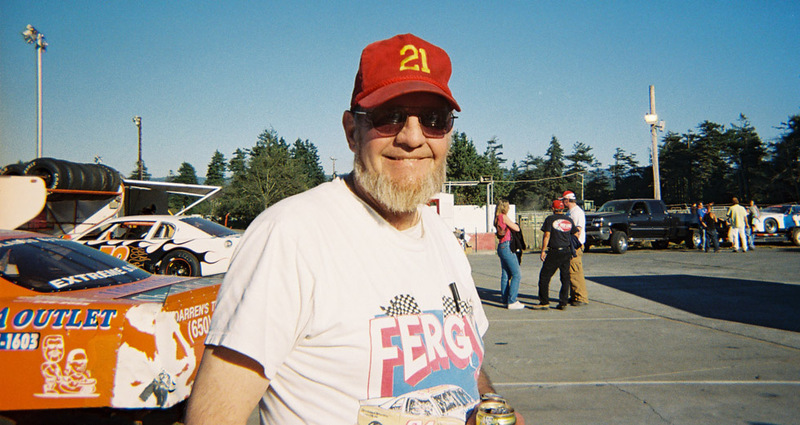 Fergy has lived in his current home in Eureka for 30 years; approximately one mile doorstep to start line from the track at Redwood Acres Fairgrounds. Before that he lived on Marsh Road by radio station KINS. “Didn’t have far to go with either house. I kept myself close”. 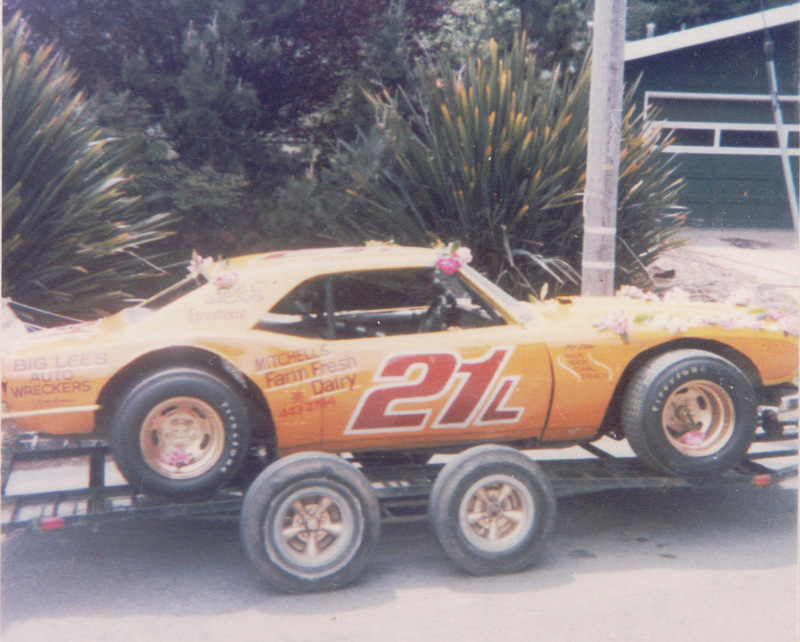 #21L Limited Sportsman ready for the Rhodie Parade. 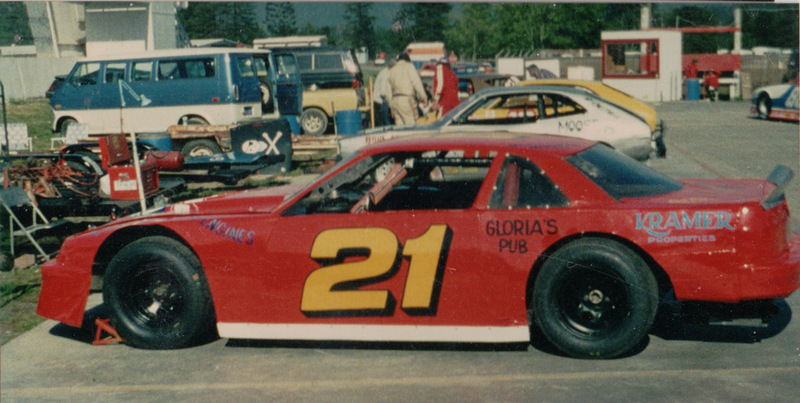 In 1982 Fergy ran the Champion’s #1, but if you looked closely there was still a tiny white “2” in front of it. 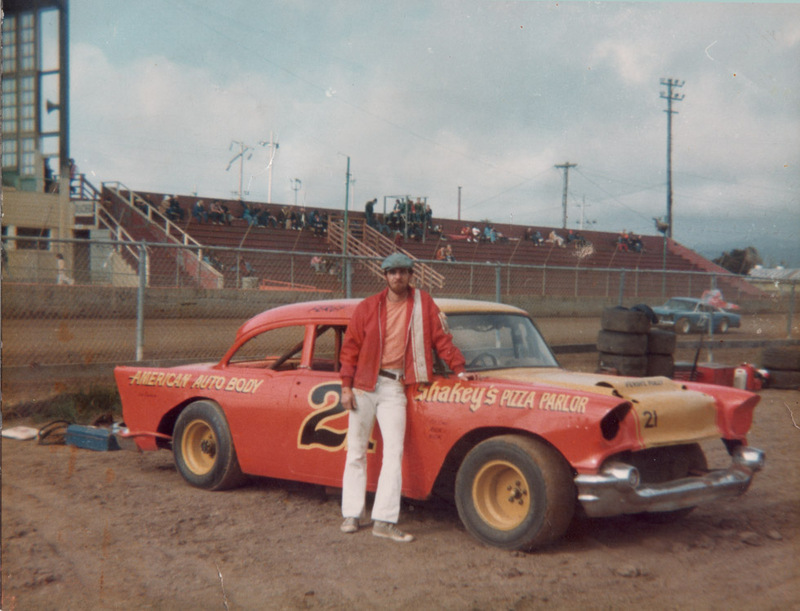 He finished 3rd in the Limited Sportsman points that year. 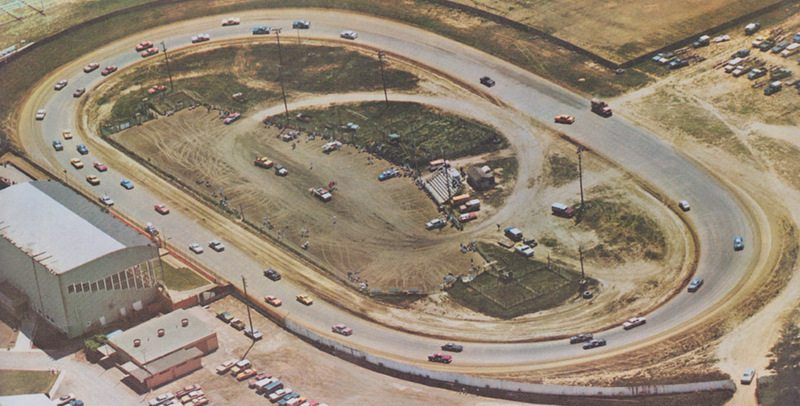 In 1988 Rich and Linda Olson took over promotion of the track and it was paved with a wall added from turn one all the way around the track, with the intention of luring NASCAR races and therefore more fans and more money to the fairgrounds, thus ending the Six Rivers Racing Association. “It was over, we were through”, Fergy says now. 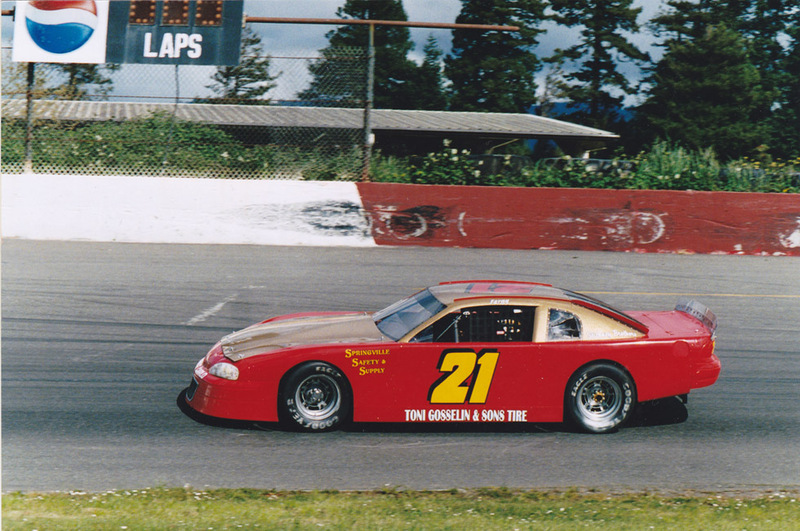 Fergy would trade his Trans Am to Crescent City Late Model driver Howard Ford for a Chevy Lumina. 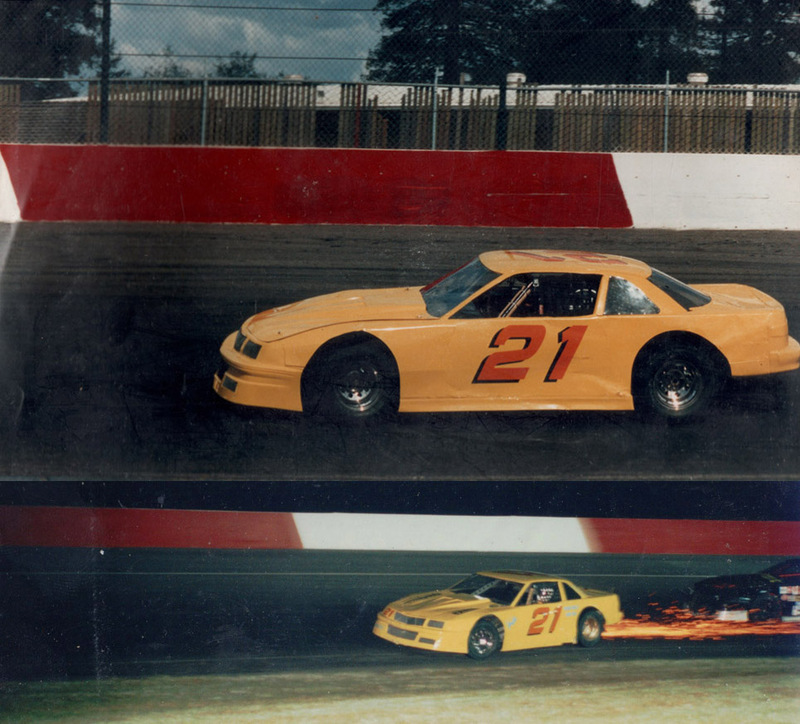 “I had a car that I was trying to race and it wasn’t working out, so I traded in that because he wanted the front end from that, and that is where the Lumina came from.” The cars over the years would change but the colors generally remained the same- always the #21 and a variation of red and gold colors. 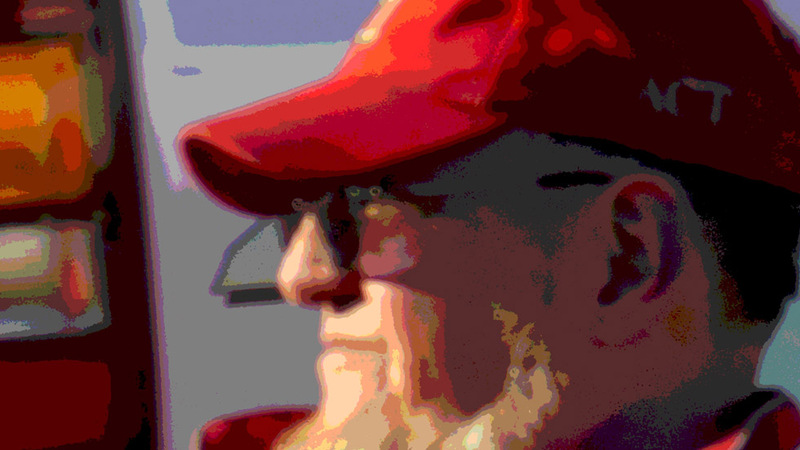 “Always trying to get the gold…”, his voice sounding like an old prospector. 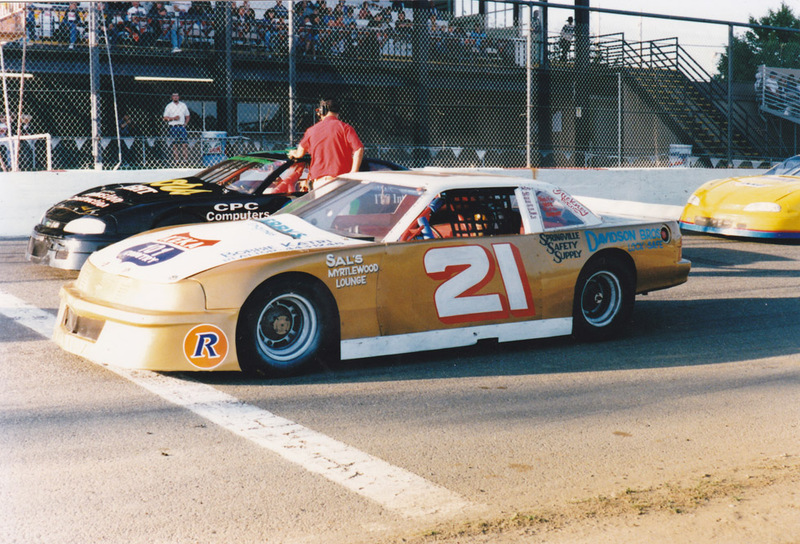 Fergy’s 1997 #21 KEKA Radio Chevy Lumina lined up next to Tim McCracken followed by Wade Lentz from Redding. 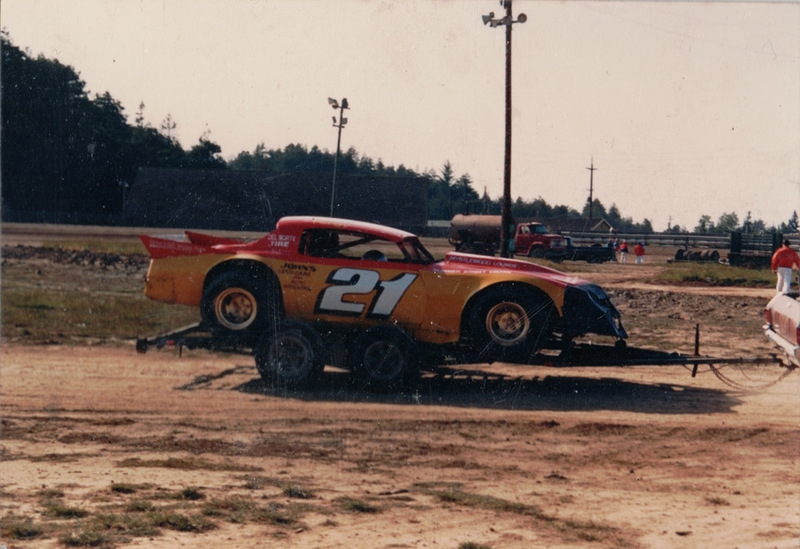 Tim would finish Sportsman Track Champ, with Fergy 4th in points that year. 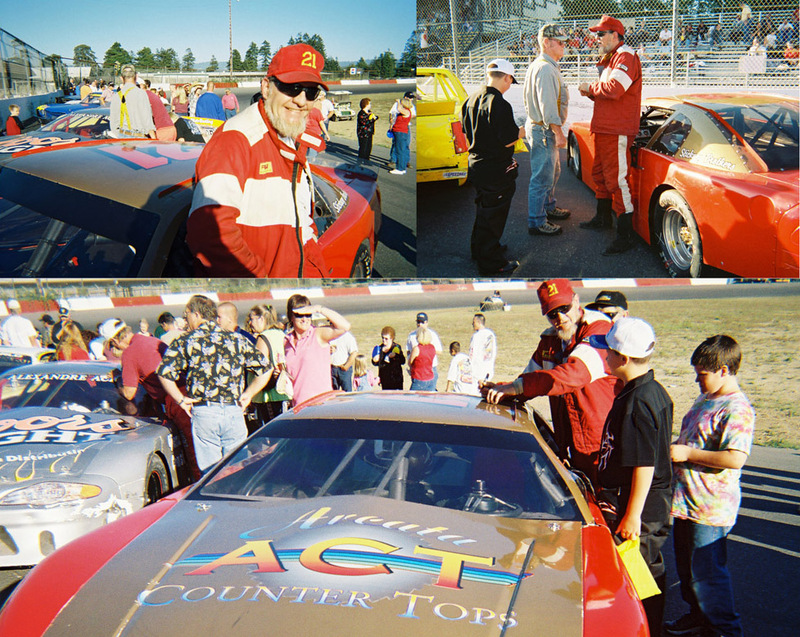 The 2001 Sizzler Monte Carlo was one of Fergy’s favorite paint schemes, designed by his son Nick. 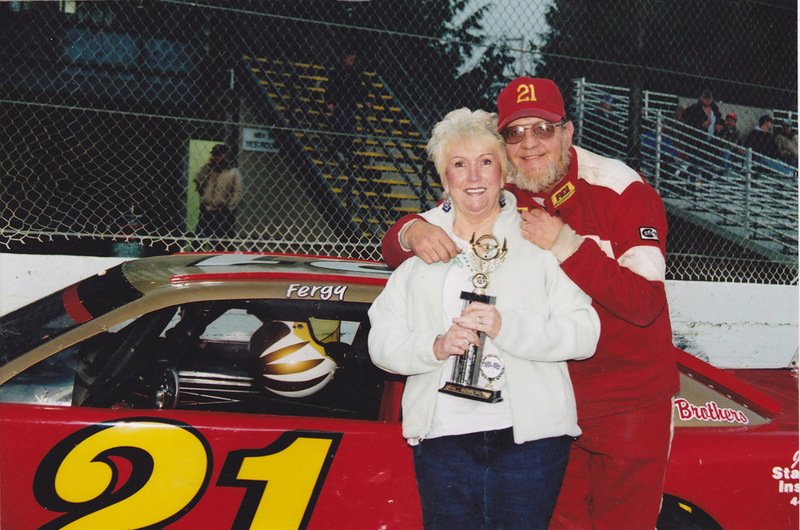 Quality Time with Family & Trophies: daughter Leslie in 1982 (left) and early 1990s (center), grandson Dylan in 1997 (right), and with wife Ann in 2005 (below) on a night Fergy was thoughtful enough to win a race for her on their wedding anniversary. 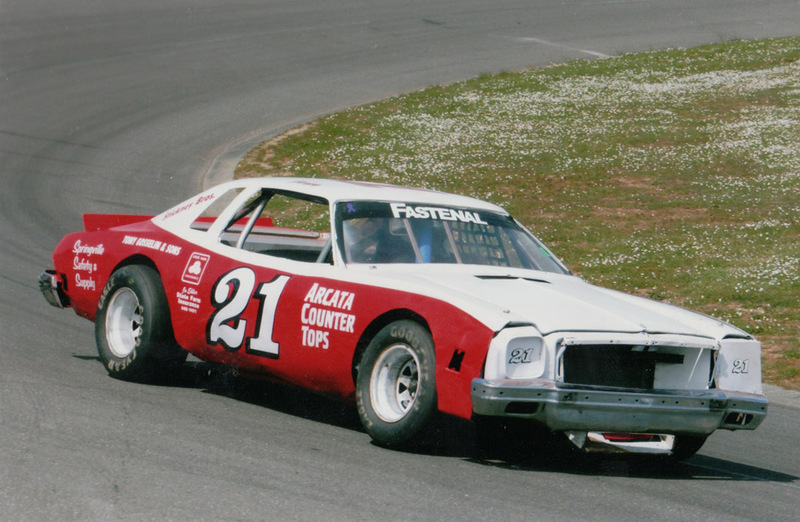 The ‘Thunder Roadster’ was designed by Charolotte Motor Speedway director of research and development Rudy Zeck, who also happens to be a two time Redwood Acres track champion. 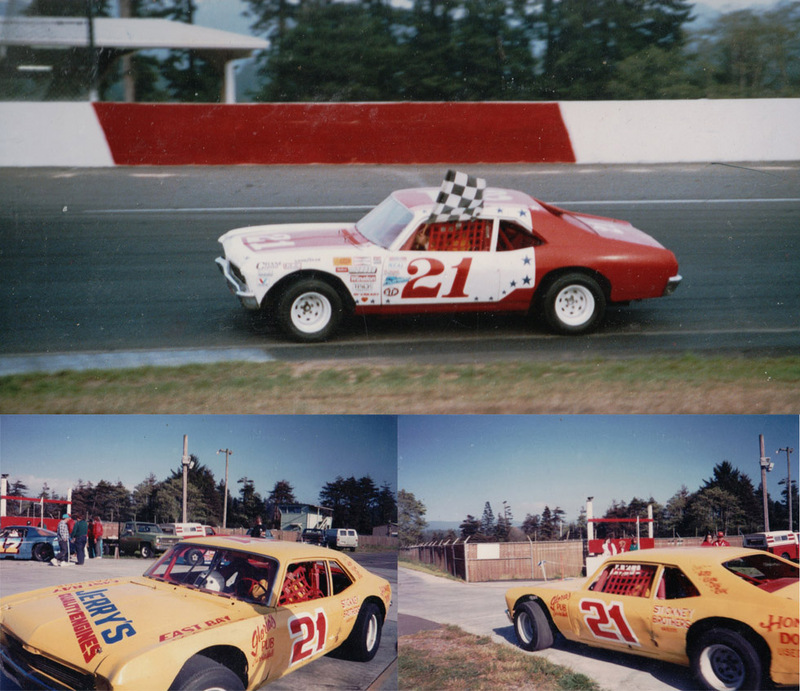 Much like Legends and Bandoleros, they are identical “spec” cars with sealed engines designed for close racing. Visually, Thunder Roadsters have the look of the Indy front engine roadsters of the 1960s. 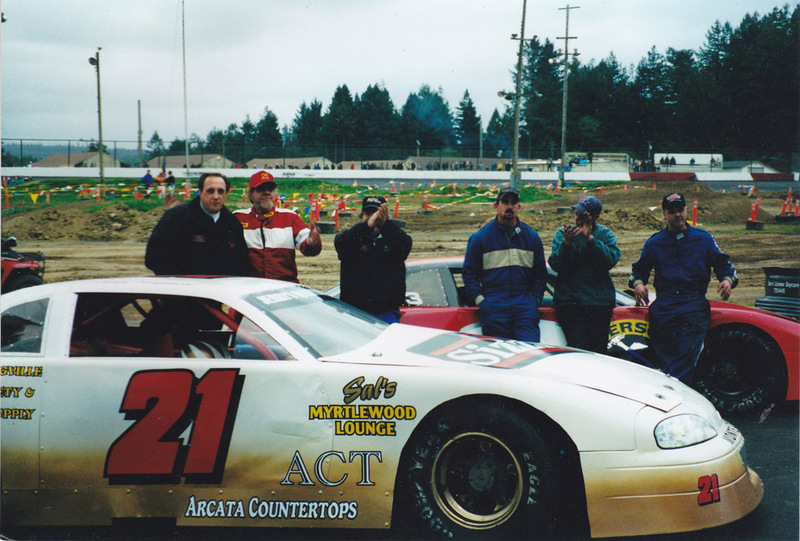 When introduced at Redwood Acres around 2006 they caught on with returning track veterans like Ken Wallan, Dave McMurray, Bill O’Neill, and Nyle Henderson. 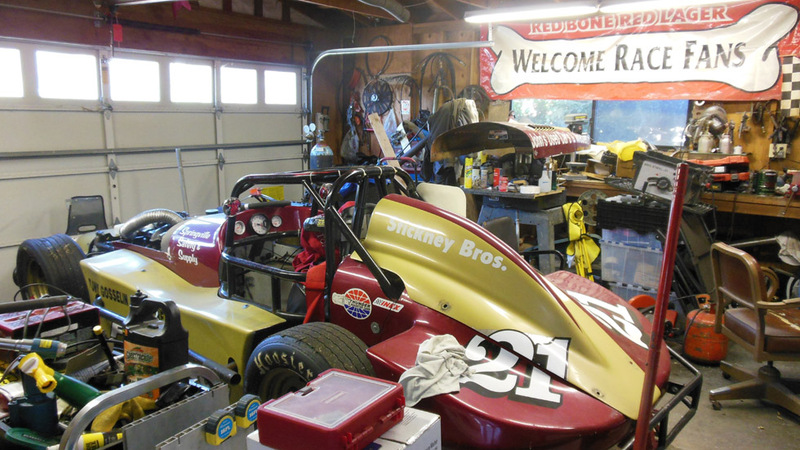 Some had not been to the track in 20 years or more. 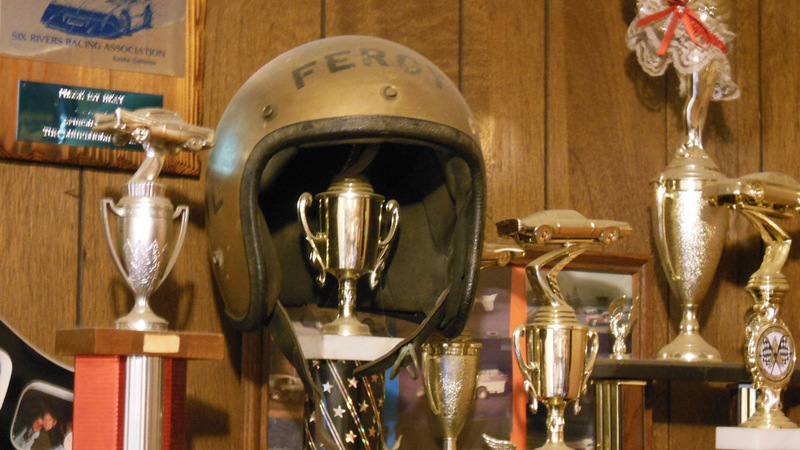 Among the trophies rests his first racing helmet, bought for $14 in 1970. My thanks to Fergy Ferguson for welcoming me into his home and sharing his great collection of photos and stories from his days in the Six Rivers Racing Association racing The Acres. We talked about doing this over the years and it was great to finally make it happen for real. 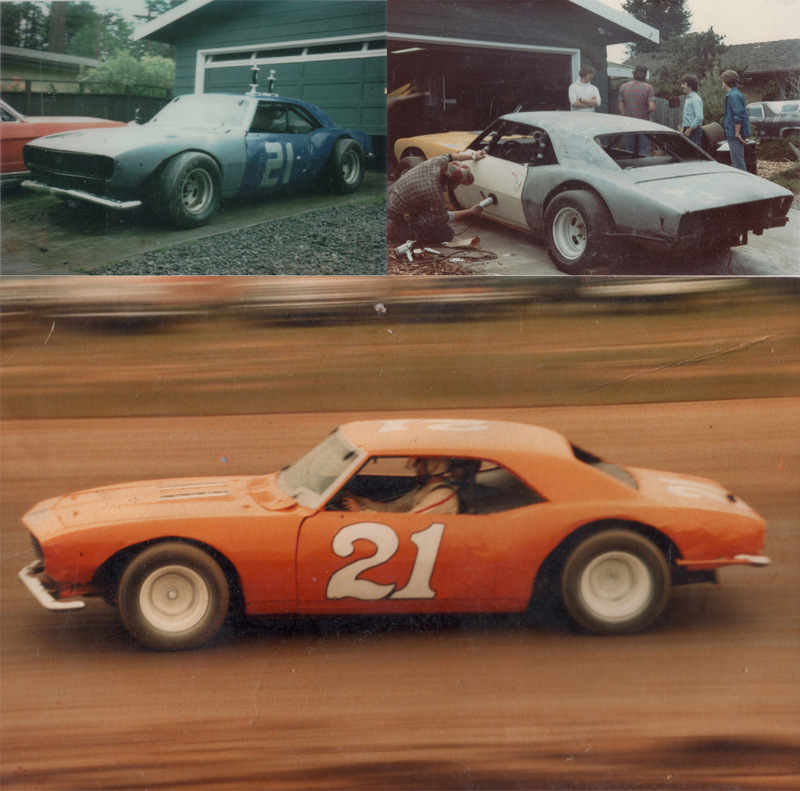 Very beautiful article my dad was my favorite driver very proud of him ! Alway yelling Go Dad up in the grandstands . 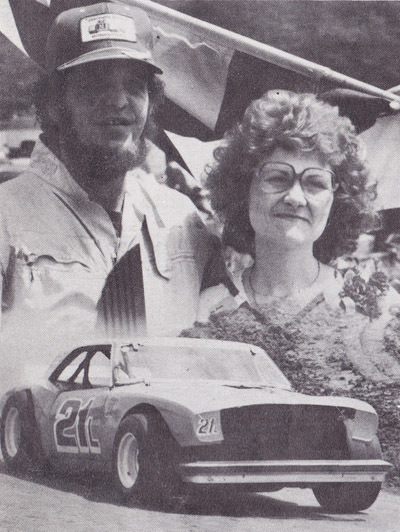 Tim this is Leslie teasley fergys daughter how can I get a copy of this article to have? 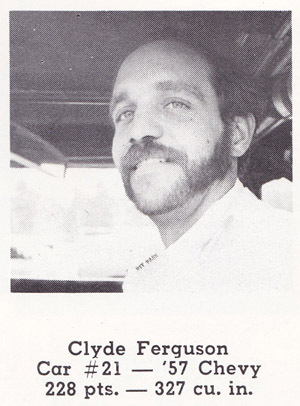 I have a funny story about Fergy 1 of his teaching of us Boys of working on race cars. There is 1 don’t do and that Fergy taught us. Do not use Champion spark plugs. 1 race day Fergy comes in from hot lapping the Thumper Camaro. 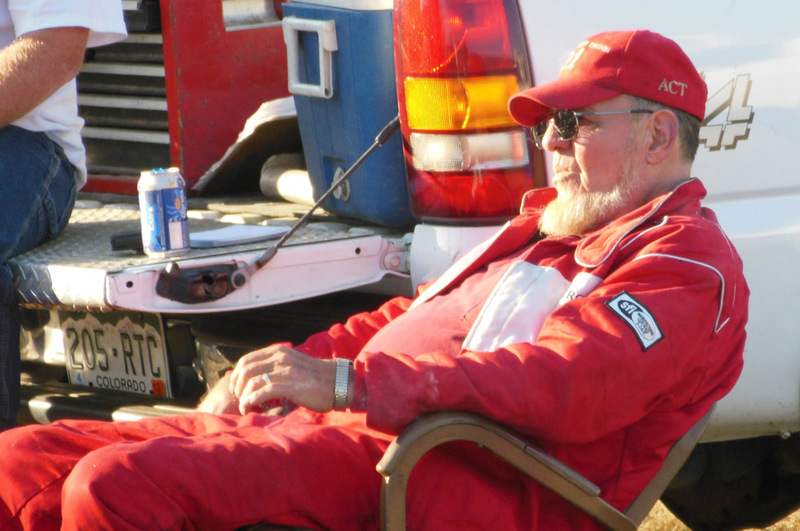 Tells us to pull the spark plugs out, Jerry was bringing some new ones. So we pulled them out and was waiting for the new ones to arrive. (Like the 3 monkeys cant see, cant hear, cant speak). So up walks Jerry lays a package of Champion spark plugs on the air cleaner. (All 3 of Nick, Duane, Myself). 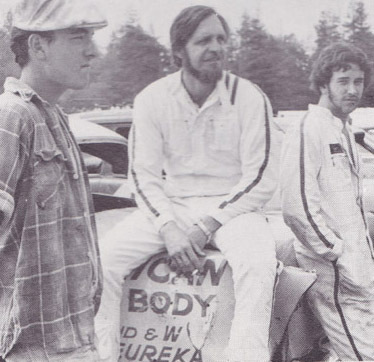 I roll my eyes, Duane reaching for them looks at Nick before he touches them Nick shakes head NO and Duane pulls back. 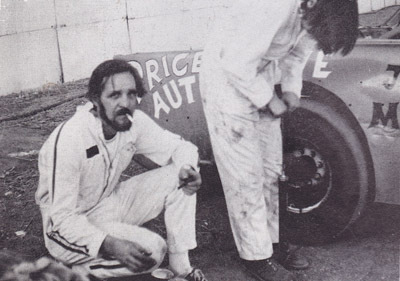 All 3 of are sitting there staring at the Champion spark plugs not saying anything. Fergy walks up and says what the hell guys waiting for? And he looks and grabs the package and gives it back to Jerry! Saying what the hell do with these? “Go Fishen” And tells us to throw the old plugs back in.